Mayday Mayday! 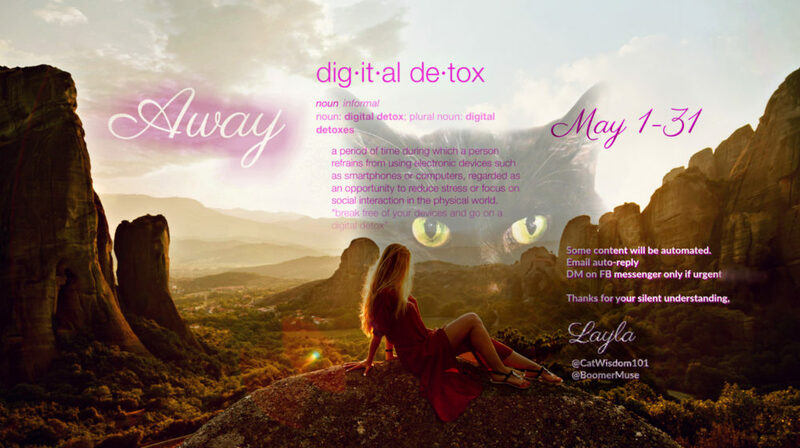 Mindful Meow 30 Day Digital Detox by feline editor Clyde. Comments are off and so are we. I’d love to say we are off on an exotic holiday or far flung adventure but we’re home, unplugged. Here are just the facts and no fluff. 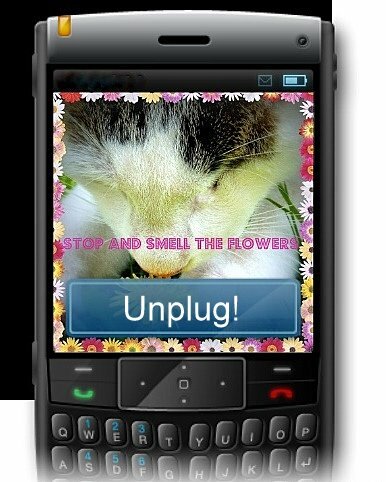 WHAT: A digital detox means unplugging from digital devices completely or partially. WHEN: Begins May 1 and ends May 31. WHY: Because it’s do or die. We tried cutting back on blogging and social media but the online world is so pervasive 24/7, it wasn’t enough. Last year was brutally stressful and after Layla wound up in the hospital last September she was supposed to take it easy, but easier said than done. The overdue Black Cats Tell All book project fell off the rails and required a gargantuan effort to get it published. In October, our book was published and days later as the marketing ramped up, Layla’s mother died. Book marketing and grieving are strange bedfellows. Things fell by the wayside. Promises were made to take time off but never materialized. The holiday season sparked new project ideas instead of quiet healing. The new year propelled new beginnings but the daily grind gradually took its toll. It was harder to focus. Layla felt more angry, frustrated and torn in all directions. There was no energy for serious writing. The rescue stories she’s been writing for Cole and Marmalade while read and shared by a huge audience is taking time away from writing books. The clincher came when a happy story of three rescued kittens last week met a sad fate. Two of the kittens died and the third may die as well. All the while, every post, every social media anything seemed to take double the time and effort for little return. Layla turned down a large contract for sponsored posts. It was a big sacrifice she could ill afford. She entertained thoughts of quitting, selling Cat Wisdom 101, anything to get off the hamster wheel. Not because she doesn’t love cats, or blogging or you dear reader, but she loves her sanity and life more. Odin has always been a fan of unplugging way back when he had a Blackberry. WHERE: Across all social media, email, text, DMs on Twitter, Pinterest and Instagram. Push notifications and alerts will be off. We will check DMs on Facebook once daily and possibly less often. Unless it’s urgent we won’t respond. Please don’t message asking if we’re okay. We will answer our landline telephone but not cell. Any scheduled calls or meetings will be honored. HOW: Mindfully. After a decade of blogging (8 years at Cat Wisdom 101) this is a first. Like anything new, it’s exciting, scary and riddled with question marks. Who knows what will happen? Us cats will relish interacting with a less tech connected human. Odin plans to take Layla on a hike. There will be lots of outdoor activities in nature and more analog everything. Being eternally curious, Layla will keep a journal and document the process. She will use the Internet minimally for writing research and watch minimal TV or Netflix. Instead of a cell phone camera, only a DSLR will be used. Yes, it’s digital but not online. It’s a risky business to disappear for an extended time. It’s much more than a blogging break. Online life is the only life Layla knows. There will be automated sharing of some old and new content that was created in advance. The merry month of May is a special month and our favorite. There will be a post tomorrow for Domino’s birthday. I will be back next Monday. Mid-month we will honor the two year passing of our feline muse, Merlin. We used to joke about unplugging for a day or two and would but this is on another level. Gris Gris and Merlin early adopters of digital detox. There are a couple amazing guest posts, we’re excited to share. 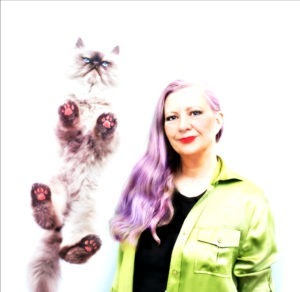 And Layla was a guest on the Purrrcast podcast which will air in May. So, we’ll be here, but not be here if that makes any sense. You can be sure I’ll be looking after Layla to keep her in touch with what’s meaningful and healthy. If you’d like to help, do something nice. Share this post. Chances are not everyone will see it and wonder what happened. If Layla has ever done you a favor, reviewed your book or promoted your product, perhaps you could leave an Amazon review or purchase our book on Amazon. It’s a nice gift for Mother’ Day. TW keeps threatening to just “disappear” without warning from the web, the blog, social media, etc to clear her head. We might have a forced one since we have to hook up the new computer someday. Enjoy your YOU time. That is excellent news. I applaud you for it and I think I may do one myself too! You give so much to cats, our community and us, now it’s time to have break refresh and decide on the future. Wishing you all a Very Happy Month of(f) May ! I’m so happy you’re doing this, Layla! The digital world and social media can be so exhausting and stressful. I hope you have a wonderful, relaxing break! good for you ! hope it helps you re-energize as well as relax! I can only imagine what a year you must have had with the launching of the book. Please take care of yourself and I wish you good health and a worry-free digital detox break from it all! I hope you come back with renewed vigor and energy. I will miss your emails–often the only decent thing in my box. But rest is needful, too. May is a great month to breathe deep. Enjoy yourself. Beverley,there will be email notifications as usual but auto-postings.Thank you so much! You deserve a break. So many let you down over the book (shame on them) and we respect your wishes. Bless you all and much love to you. dood……we think what momz doin……everee one shuld…..kinda like flash bak ta simple timez when peepulz….lived life…..
Take all the time you need, you are the most important part of your own life. I’m glad your human is taking care of herself. 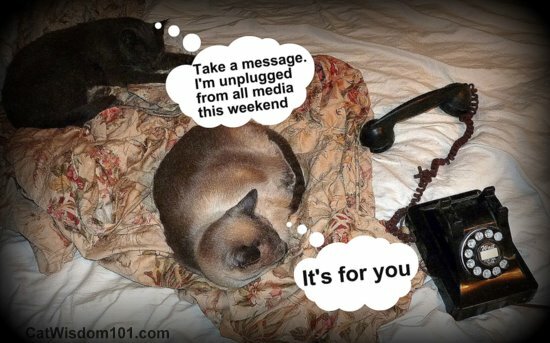 So glad you are unplugging. I was thinking a short while ago, that I simply MUST stop editing online for a few days. It’s my job but…. I haz spousal support, too. Nap now. Ched, too, or maybe later. Then clean, dishes, mailbox. Tomorrow errands. Digital is so much more demanding than we think. It’s addictive. And it’s tiring on the eyes/brain. We will all be happier, healthier when we refresh ourselves after a break. Happy happy happy you’re doing this, Layla. I am glad youre unplugging. It is good for you, and you need time to yourself.. luckily for me, I am only on a computer no cellphone bugging me etc. It’s easier but for those who have to be ‘on’ all the time, I cant imagine the stress. After typing this, I am off until 9pm or so. I have wood to stack for the woodburner! Go find peace, find solitude, seize the day, pet the cats, enjoy your family and friends. Unplug and unwind. I will miss you terribly, and the cat gang and your news, but will be here when you return. If mama ain’t happy, then nobody’s happy! YOU GO GIRL!!!! Enjoy every glorious nano second!!! We are not so addicted to being constantly “on” so we don’t have to make as big of an effort to “unplug”. LOL we don’t even own a cell phone!